The second Sunday of every month is Family Free Day at MODA! Join us on Sunday, October 8 and check out MODA’s newest exhibition, Text Me: How We Live in Language, an exhibition that attempts to organize, express, translate, and reflect both how we live in language and how language now defines our lives. This exhibition does contain adult content, and parental discretion is advised. Please check in with MODA's front desk upon arrival for more information, or call 404.979.6455. Click below to register for exhibition admission this Family Free Day! In addition to checking out MODA's newest exhibit, we're also excited to announce that we will be hosting a couple of educational exercises! See below. Get loose and participate in a laughter yoga session on the plaza from 1 to 2 p.m. No need to bring your mats, only you and your laughter are necessary! Click below to register for Laughter Yoga, 1 p.m. to 2 p.m.
Got an idea for a comic book character? Join MODA, as we collaborate with The Sid Foundation, this Family Free Day and work with the design team behind Lung Girl comics to learn more about the process behind bringing comic book characters to life in three 30 minutes sessions from 2:30 to 4:00 p.m. During the drop-in exercise, practice drawing and writing for your character’s own story arc. As always, Family Free Days is a completely free event, but we do ask that you please register in advance so we know how many people to expect in our sessions. Walk-in visitors are welcome, however sessions may reach capacity. The Sid Foundation is focussed on raising funds and awareness for lung transplant research. 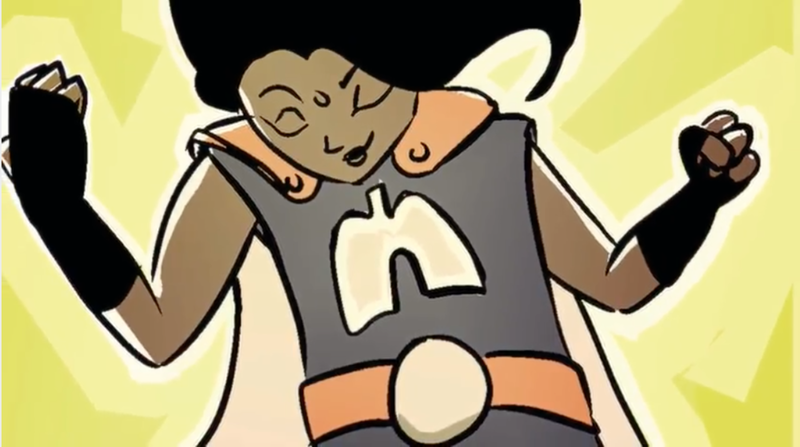 They raise awareness in many ways, including launching their very own comic book character, Lung Girl! We are excited to partner with the Sid Foundation this Family Free Day.